Mechanical contractor relies on Fleetio as its all-inclusive fleet database while integrating its maintenance shops and telematics devices. 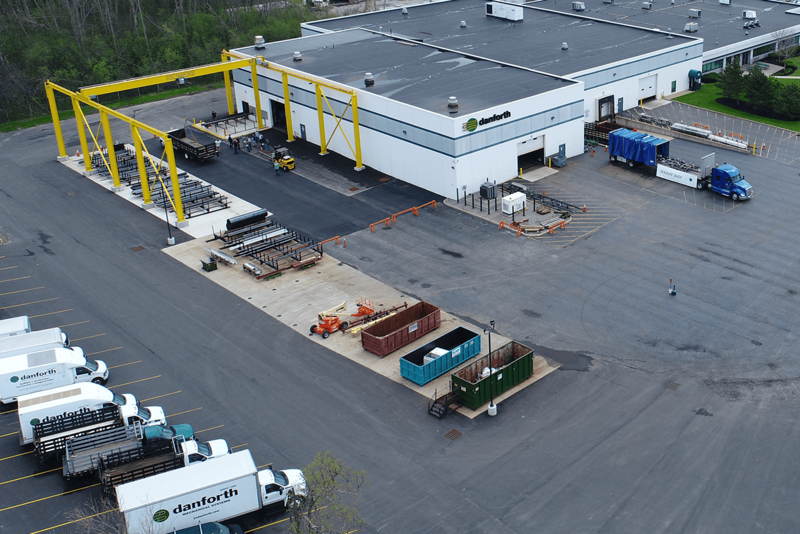 JW Danforth is a mechanical contractor providing services throughout the Northeast. Founded in 1884, the company specializes in the design, fabrication and construction of projects. Some of its focuses include heating, ventilation and air conditioning (HVAC); plumbing; piping and building electrical controls. It serves a variety of industries ranging from healthcare facilities, schools, municipal and commercial buildings. Over 130 years has elapsed since JW Danforth’s inception, and there are no signs of slowing down. The company operates a fleet of over 170 assets, whose reliability is essential to delivering exceptional quality of work and therefore needed an equally superior system to manage its assets. Before having a solution like Fleetio, JW Danforth managed vehicle maintenance using spreadsheets, which was unorganized and difficult to track. One of the company’s biggest challenges was that it lacked a system of record for its assets. Due to this, it needed to implement a capable database that employees in the field could also access. Trying to keep track of vehicle maintenance can be difficult, regardless of fleet size. In 2018, Fleetio introduced Outsourced Maintenance Automation, a new way for fleets like JW Danforth to easily manage its maintenance vendors and billing using electronic repair orders and approvals, all in one convenient location. Prior to Fleetio’s outsourced maintenance automation, the company had to create work orders from each of its service requests. Now it has a system with all of its vendors and can update work orders electronically. With Fleetio, the company can also add information for things like differential service and leverage data from fuel card mileage to help determine maintenance schedules. Fleetio’s open platform and numerous integrations were appealing to JW Danforth. Specifically, the Geotab integration was immediately deemed useful. The company uses the odometer updates, which are pulled automatically in Fleetio, to help determine the maintenance schedule for its assets. This enables JW Danforth to maintain the health of its assets and prevent any potential downtime from unexpected issues. Having all the necessary fleet data stored in a comprehensive software like Fleetio has delivered tremendous insight and made managing assets much easier. Automated Diagnostic Trouble Code (DTC) notifications and vehicle locations are other great features of the Fleetio and Geotab integration that JW Danforth takes advantage of. Knowing exactly where assets are located is a tremendous help for the company’s dispatchers. Since JW Danforth is a multifunctional contractor, it relies on a variety of assets that go beyond conventional vehicles. Fleetio enables the company to effectively track forklifts and other equipment by adding custom fields to classify and organize its data. Additionally, assets are grouped based on their classification. For example, assets in the fabrication and service divisions are assigned to a specific driver. However, assets in the construction division are constantly rotating, which makes vehicle assignments an important feature. It’s no wonder why the company continues to succeed over the years with help from Fleetio. JW Danforth has also been essential in providing tangible input for additional Fleetio features.